Sainte Enimie (one of the 'most beautiful villages of France') is 20 kilometres south-west of Mende in the Massif Central. 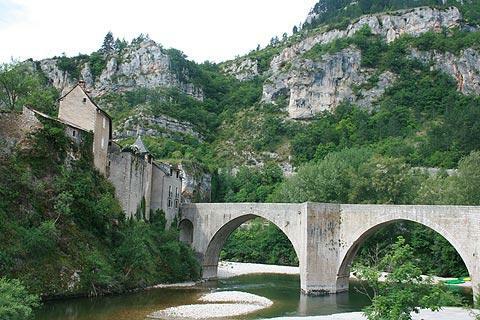 Set in the dramatic scenery of the Gorges du Tarn, Sainte-Enimie is in a lovely position surrounded by the cliffs that the river has carved over 1000's of years. With its origins dating as far back as the 6th century, the village of Sainte-Enimie we see today falls neatly into two parts: the cafes and shops along the street next to the river, facing across to a ridge on the opposite river bank; and the old town that sprawls up the hill behind. Walk onto the bridge across the river for a good view across the town and upstream. Between the two parts of Sainte-Enimie (behind the cafes at the bottom of the hill) there is also a street lined with gift shops and other small businesses. Visit Saint-Enimie tourist office as your first port of call for details of the guided trail around the town (the individual buildings also have very interesting and informative notices, but these are in French only - and you will need the map to find them in the first place...). 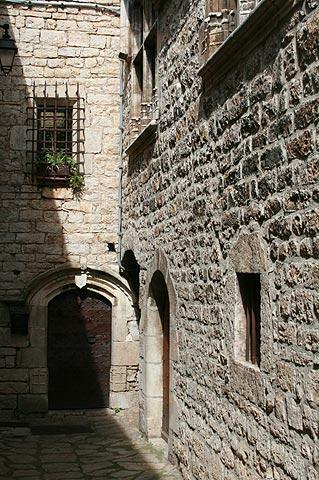 Within the old town the houses are carved from the local sandstone, and narrow cobbled streets lead you from one fascinating ancient building to the next. Often the paths seem to be part of the rock itself as you climb steps literally hacked into the mountain. The highlights in the old town (among others) include the houses on the Place au Beurre and the nearby Halle au Blé (wheat hall), the ramparts and the Sainte-Madeleine chapel at the top of the village (there was once a benedictine monastery in the village - the part that now remains is the Chapel of Sainte Madeleine). On the slopes beyond Sainte-Enimie you can see the terraces that industrious workers have built on the slopes behind the old village in order to grow produce in the inhospitable environment. France This Way comment: Sainte-Enimie is a lovely village to explore, and more extensive than you would guess from the river below, with the belvedere above the town giving a good view across the whole village and valley. 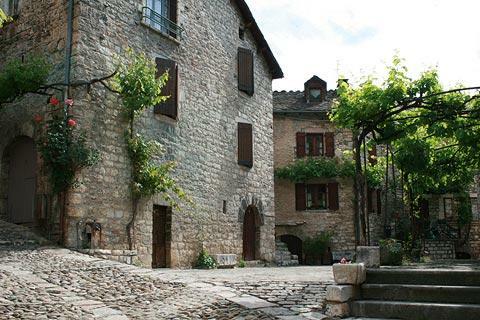 The surrounding countryside, both in the Gorges du Tarn and the surrounding verdant landscapes and bleak mountains, has plenty of peaceful walks, where you can enjoy the peace of the countryside and several other villages that are very beautiful such as Castelbouc and Saint-Chely-du-Tarn. 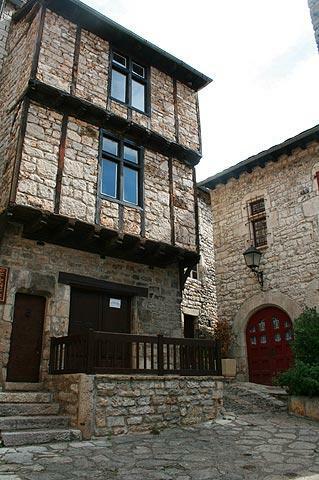 The small town of Florac is also not far east of Sainte-Enimie and a visit is recommended. 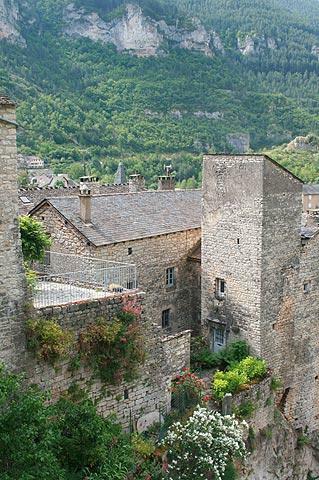 You can find more local travel ideas in the Lozere guide and the Languedoc-Roussillon guide.